Last week, Bluewrist Inc. (Markham, ON), a provider of robotic and vision solutions, and LMI Technologies (Delta, BC), a provider of 3D vision sensors co-hosted the 3D Metrology Seminar at Techconnex in Markham. With attendees from many automotive Tier 1 Suppliers, we were able to introduce the benefits offered from the combined power of robotics and 3D vision for 100% in-line part inspection for quality control. The interactive presentation/demonstration covered the basics and the latest trends in 3D measurement and inspection, robot guidance, and robot calibration. 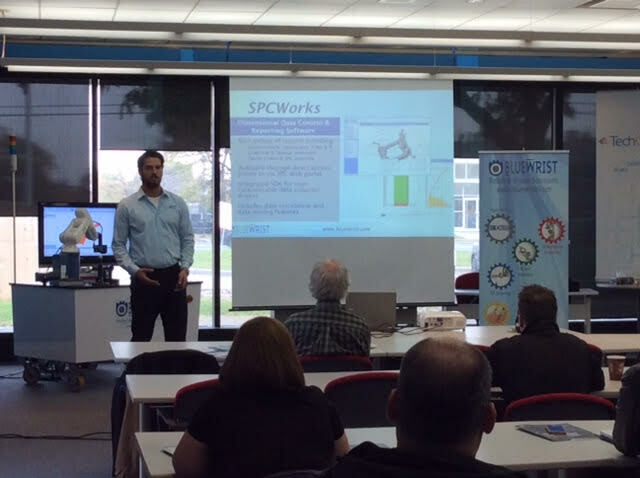 The seminar ended with a live demo of the LMI Gocator 2300 and 3100 series sensors, as well as Bluewrist’s Integrated PreciScan3D station, which allowed attendees to understand how Bluewrist solves customer challenges in today’s manufacturing. Stay tuned for upcoming seminar dates!